Spooktacular Dance Party Benefits Pasco Kids First from Nature Coast.TV on Vimeo. 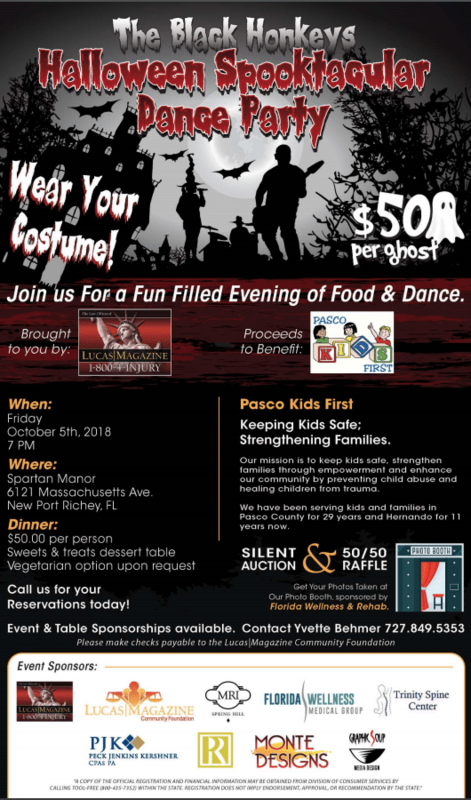 Join us for a fun filled evening of food & dance, proceeds to benefit Pasco Kids First, Inc., this event is presented by The Law Offices of Lucas Magazine. The Black Honkeys will be performing throughout the evening. Tickets are $50 per a person, table sponsorships available please contact Yvette at (727)849-5353 or yvette@lucasmagazine.com for more information. Halloween costumes are optional. Hope to see you there! Sponsorship opportunities and tickets are available online at http://www.lucasmagazinefoundation.com/events/.